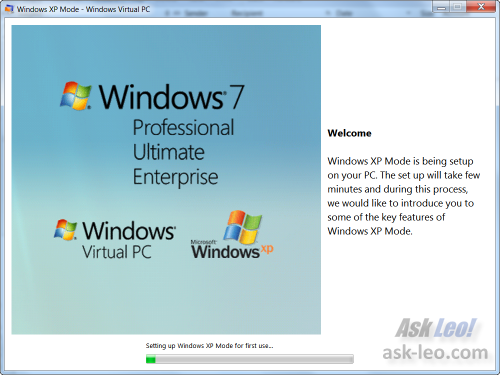 Windows 7 Professional and above include "Windows XP" mode. If you have programs that don't work or aren't available in Windows 7, XP Mode may help. I'm hearing a lot of backlash against Windows 7 for a completely unexpected reason; not for incompatibilities or instabilities but for the removal of Outlook Express. 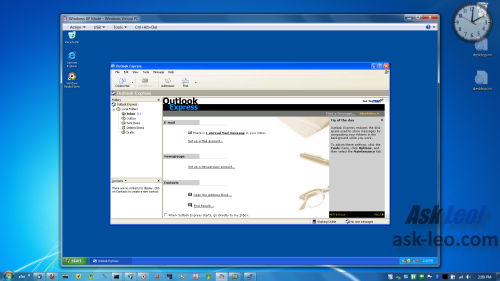 Outlook Express was actually removed in Windows Vista, being replaced by Windows Mail. That, in turn, was removed from Windows 7, and replaced with ... nothing. The official approach is to download Windows Live Mail, which is very Outlook Express-like. But it's not Outlook Express. It turns out that, yes, Windows XP Mode might be a solution. It's not terribly simple, but it can work. In fact, it can work for many programs that for one reason or another simply will not work in Windows 7, but used to work in Windows XP. Before I start, I do need to be clear: I'm not actually recommending this as an approach to using Outlook Express, specifically, in Windows 7. Not only is this somewhat cumbersome just to read email, but Outlook Express in general has enough problems that I'd strongly recommend moving away from it now. It just isn't worth this effort. "I show this ... as an example of the kinds of things that Windows XP Mode can be used for." I show this in part for those diehards that must have Outlook Express at any cost, and as an example of the kinds of things that Windows XP Mode can be used for. Windows XP Mode is more than a "mode" - it installs an actual copy of Windows XP Professional as a virtual machine within Windows 7. That means you can run Windows XP within a window in Windows 7. Windows XP Mode is not included in the actual Windows 7 disks; it's a free download from Microsoft. Windows XP Mode required Windows 7 Professional or better and a computer with a CPU capable of hardware assisted virtualization (the download page includes a tool that will tell you if you have this). I also recommend a huge chunk of disk space, and some patience - the download is over 500 megabytes. Once downloaded the setup is actually very simple - the standard licensing term agreement and not even that many options or choices. Run it and you'll find Windows XP running - in its own Window - on your machine running Windows 7. I Have XP Mode, Now What? Think of it as a separate machine running Windows XP. Treat it as a separate machine running Windows XP. That means installing things like security updates, anti-malware software and whatever else you would do to a new machine that you'd just set up using Windows XP. It also means that you can move your Outlook Express mail to this "new machine" and resume using Outlook Express. 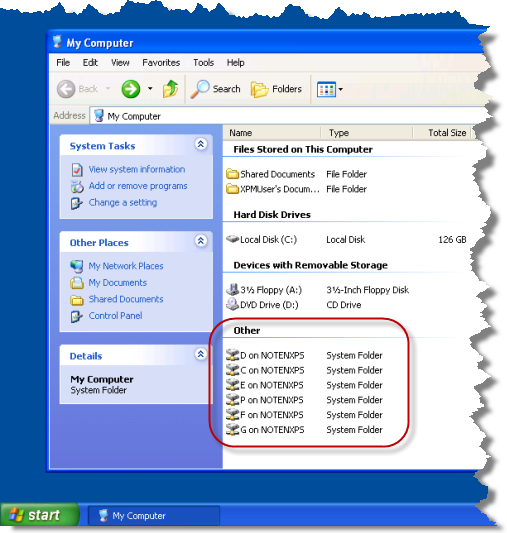 The "C:" drive within a Windows XP virtual machine is a virtual hard drive that's stored as a single file as part of the virtual machine configuration. Naturally, that's where Windows XP stores its configuration, and your email, by default. I strongly recommend a good backup regimen within the virtual machine to back up your critical files - like your email - in a way that will not require the virtual PC of Windows XP Mode for recovery. As you can see above, all the drives on my Windows 7 machine - including any mounted volumes and local area network connections I might have - appear as folders accessible from within the Windows XP virtual machine, making data transfer in and out of the virtual machine a snap. I've actually just scratched the surface on Windows XP Mode - Windows Virtual PC includes many features designed to make integration with legacy applications fairly easy. All we've really done above is setup a virtual machine, run it, and run one application within it. 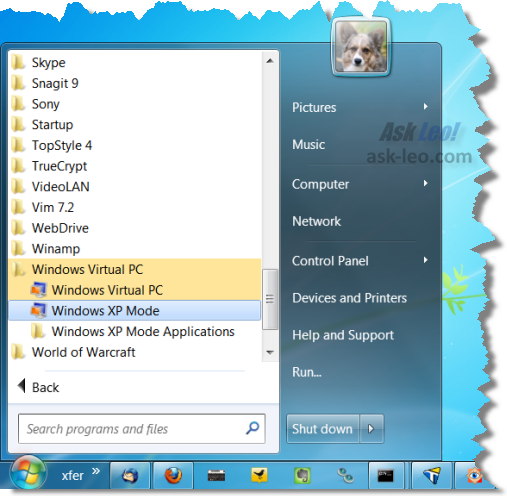 All in all Windows XP Mode can be a very useful tool for overcoming compatibility issues, particularly with older software for which there may not be a Windows 7 alternative. While I don't actually recommend this approach for Outlook Express, the fact that it can be used shows just how much is possible. In effect, every copy of Windows 7 Professional or better includes this "free Windows XP" just for the downloading. What do I need to set up using my Windows XP virtual machine software? Virtual machine software is incredibly powerful, but hard to conceptualize. Viewing a VM as a separate machine can make certain issues clearer. 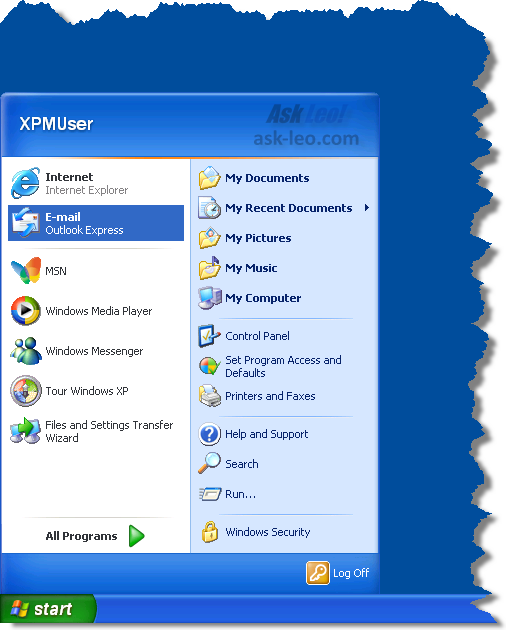 Where is Windows Mail, or Outlook Express, in Windows 7? Windows Mail has been removed from Windows 7, along with several other applications. We'll look at where to find their replacements. I have just gone from XP to 7 and as I like things simple I have have found it such a big jump. I did finally find info on Windows Live which does contain an updated version of Express and I find it quite simple to use. It's what XP Mode should have been... Runs on any Windows, no hardware virtualization required, and it actually transfers all your applications from XP to 7 by itself! So you can work with no hassle at all. Would love to hear your review on that. I'm not going to go deep, but it looks like an interesting combination of a virtual machine technology like XP Mode or Parallels Desktop, plus a migration tool like Laplink's PC-Mover. My question is if you're simply going to move everything over an simply use it as Windows XP, why install Windows 7 at all? I just installed but when I tried to open it I got some crap about my BIOS not being configured for this. HELP do I have to fiddle around with the BIOS now???? Coudn't MS make it a bit simpler? Not Microsoft's fault - some computers have hardware virtualization turned off in the BIOS and it's not something that MS can turn on for you. You'll need to turn it on, assuming your PC supports it. OK I just looked it up on the MS site and configured. It's quite simple after all. The problem is I still can't open any of the DOS programs that I wanted to. I thought that the XP mode will allow me to use the old DOS programs but.... Anyone got any ideas? If they worked in XP I would expect them to work in XP Mode. To know why it's not working we'd need a lot more information about what happens when you try, and how you're going about trying. 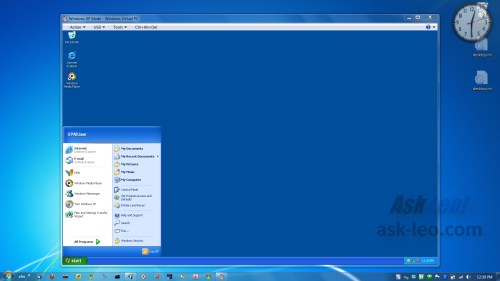 I have Windows 7 Home Premium with virtual XP Home installed & don't have to worry about hardware virtualisation. How? - installed Sun's VirtualBox software & run XP Home inside this. This saves the expense of having to buy Windows 7 Enterprise, Business etc necessary to run "Windows XP Mode"
I don't have Outlook Express on my current Windows XP system; I have regular Oulook and like it just fine. If at some point I have to change to Windows 7, will I be able to keep regular Outlook? From everything I've heard, it's better than Outlook Express. It is certainly better than webmail via Comcast. My feeling has always been, "If it ain't broke, don't fix it." I see no reason to change for the sake of change. But my son and I have been talking about getting a laptop, and it seems they all come now either with Vista (which we definitely don't want) or Windows 7, not with XP. Outlook and Outlook express are unrelated to each other. Outlook will continue to work on Windows 7. When Outlook Express fell of its perch a few months ago I switched to Windows Live Mail, (which is, confusingly, not the same thing as Windows Live Hotmail)which looks and feels just like Outlook Express, but seems to work better. I haven't yet found any aspect of Outlook Express that isn't there in Windows Live Mail. It picks up my Hotmail account fine, and seems a perfect replacement for the late lamented Outlook Express. This is working under XP at the moment, so would I presume it would work under Vista or Windows 7 also? Outlook Express is one, although not the primary, reason I chose Win XP for the OS in my current, custom-built computer (by JNCS in Fairport, NY). A MAJOR...REALLY MAJOR feature of OE vs. Windows Mail or Windows Live Mail is that OE supports identities (if that's wrong, will someone please tell me). In all the comments about this issue, I never see any that mention this feature. I have a home business, so have 2 e-mail addresses. I do NOT want to have to set up 2 user IDs and switch between them to work on separate business and personal e-mails. I have heard, but have not tried, that using "profiles" in Thunderbird can be as useful, if not more so, that Outlook Express identities. Would love confirmation on that. Just for giggles! Seems Microsoft is giving an XP virtual machine license free to users of Windows 7. Did I read a free download of around 500 MB? Windows Live Mail is quite superior to Outlook Express. It does multiple email accounts and real-time spell checking (like Microsoft Outlook). You can install and import all your mail from Outlook Express/Windows Mail (unlike Thunderbird). unless some major, or at least majorly annoying, bugs were recently fixed (email sorting, large attachment download time, spellcheck) were recently fixed, I say Thunderbird is not the best solution. I miss my Outlook Express, a lot. Tried the Windows Live option but never really liked it. Switching to Gmail was a semi-acceptable option but having several accounts' email available under one single program (standard feature of OE) will make me miss OE forever. Wouldn't it be a whole lot simpler just to keep your XP system for this purpose, if it's still running. I did, but not for Outlook. I guess what I'm trying to say is if you want XP, it's going to be supported until 2014. Keep it. On your Windows 7 system, I've found that most of the programs that I ran on XP runs on Windows 7. For a excellent mail program, Thunderbird should be sufficent. Mozilla has come a long way in product development. Look at the rise of Firefox. I'm running 3.6 BETA 4 on all three of my systems (two laptops that dualboot Win 2K Pro/XP Pro & a PC with Win 7 Home Premium). What's the big deal about "XP Mode"? You can have both XP and Win 7 for years to come on separate systems. And you can have separate mail systems as well. There's plenty of time to adjust. I'm keeping my Win 2K/XP Pro laptops until they break. But when they do break, I'll have moved on. Outlook Express is unique in that it has Edit - Source - Preview features. Windows Live Mail does not have them. The source in OE is self-correcting up to a point and very useful even for manually coding the HTML for a web page. This great facility seems to have escaped our attention. Anyone who has used this editing feature of OE will swear by it. You can edit this and OE will make some necessary corrections after you go back to Edit and return to Source. However, if you paste a page like msn.com, yahoo.com, aol.com with all the images etc, the source code will not be so amenable as it reflects and obeys the original source. � Eureka! I installed Mozilla Thunderbird 3.0 and although my previous experiences were anything but satisfactory, I am amazed at how much TB has now changed. It can receive mail from hotmail, gmail, aol mail and even from the free version of yahoo mail! - Sending a message via Thunderbird used to be an exercise in both patience and futility ending in disgust. That is all history now and TB sends messages instantly. Have just returned from Cruises around South America, Antarctica with Princess Cruises.Installed Windows 7 (basic) on my laptop before departure. Worst thing I ever did. Comms on ship $0.75/Min. With no Outlook Express Costs horendous. Drop outs make worse. Could have bought several laptops with Fees and had Xp and 7. Need to have access to ALL emails without being online. Have I gone wrong somewhere? That means installing things like security updates, anti-malware software and whatever else you would do to a new machine that you'd just set up using Windows XP." So, does this mean than once XP SP3 support is phased out, one using XP mode will be left without security updates for XP? Will the computer then be as vulnerable to malware, viruses, etc running XP within Win7 as when XP is run stand alone? I've been using WinFax for many years -- since it was a Delrina product. Symantec bought Delrina and WinFax was doomed, like lots of other software they bought. WinFax would not run on Windows 7, so Windows XP Mode was the only way I could continue using it. I do have to "mount" my modem in XP mode before starting WinFax and sometimes have to re-introduce the modem to WinFax, but I still have my old faxes and addresses. The only problem is the awkwardness of having to enter XP Mode just to receive faxes, so I've limited things to just sending them. That's all I really needed anyway. The big question for me is - "is the clipboard content transferable from Win 7 to the virtual PC?" I have several computers, so that would be the only advantage to me ... however, it would be a BIG advantage. It depends on the VM software being used, but for Parallels at least the answer is yes, if you install their tools in the VM. I believe the answer is typically yes for other VM products as well. In your newsletter arrived today you mention voice-recognition software, though avoiding saying which ! I used ViaVoice about ten years ago, and have just bought Dragon. Known issues You may experience issues running this program on Windows 7. Just what does this mean in real terms ??? > Express that isn't there in Windows Live Mail. I know it's there, for I can add contacts to it, and am presented excerpts when I start to enter a name in the "To:" field. But how to access it for inspection or edit - well, that's still a mystery to me. Thank`s Leo,your solution solved the problem to my question,now i can use Xp within 7. I am not able to use a HP printer connected to a PC running XP and shared from my laptop with Win7 because there are no drivers to support it. Can this be solved using the XP mode? Or are there any other suggestions to solve this? Sometimes a XP drivers will work in XP mode other times they won't. It's one thing you'll just have to try. Over the years I stored hundreds of important Outlook Express emails on my hard drive (that is outside the OE environment). These files have a ".eml" extension. I tested a few of these on a Windows & machine and find that although some of them can be opened in MS Word, some of them could not be. Any ideas? I haven't yet set up my new computer which will have Windows 7. Is Windows Virtual PC still available from Microsoft? It seems that all the links I try to their pages (from the above article and other sources, including Microsoft's own website) result in "page not found" messages.